The African Heritage Diet features familiar foods prepared in easy and aﬀordable ways. Getting started with the African Heritage Diet couldn’t be simpler. Try any one of these steps… and then another… and another. For more inspiration, check out our free African recipes or our A Taste of African Heritage cooking classes! 1. Boost Flavor With Spice. Curries, peppers, coconut, fresh herbs, garlic, onions, fresh lemon, and all spices are low-sodium ways to add incredible ﬂavors to grains, beans, vegetables, and seafood. Try a diﬀerent herb every week for a touch of African heritage. 2. Make Vegetables the Star of Your Plate. Steamed, sautéed, roasted, grilled or raw, enjoy veggies like okra, cabbage, green beans, or eggplant in larger portions than the other parts of your meal. If you’re grabbing seconds, go for the veggies! 3. Change the Way You Think About Meat. Use lean, healthy meats in smaller amounts for ﬂavor. Replace ham-hocks with smoked turkey or ﬁsh, or pile on the herbs and spices instead! 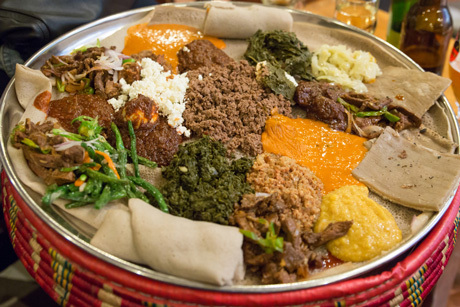 With the zesty ﬂavors of African heritage, you may not even notice the meat’s not there. We’ve got plenty of vegetarian recipes and a guide to help you on the Oldways website. 4. Make Rice & Beans Your New Staple. Fiber-ﬁlled Rice-and-Beans is a favorite meal all over the world. Add African heritage whole grains like millet, sorghum, and teﬀ to your soups, or partner them with peas. 5. Enjoy Mashes & Medleys. Bake or boil sweet potatoes, yams and potatoes or mash them with eggplants, beans, grains, onions, and seasonings. One-Pot Cooking lets ﬂavors sing together! Let okra, corn, and tomatoes collide in a “Mix Up,” or add extra color and ﬂavor to your greens with purple cabbage and leeks. 7. Family Support & Food Fellowship. Food is meant to be shared, and so is good health. Think of your dinner table as a “healing table,” a place where people come to share beautiful, fresh foods and reinforce a long, happy and healthy life. 8. Make Room for Celebration Foods. We all have special foods that have always been in our families. Some of these foods may fall outside the guidelines of the African Heritage Pyramid. Save these foods of meaning and memory for special occasions. Enjoy them infrequently, but when you do have them, enjoy them whole-heartedly! 9. Jazz Up Fruits for Dessert. Fresh or frozen fruits like melons, peaches, berries, and mangos—plain or sprinkled with chopped nuts or coconut—add a sweet taste of satisfaction at the end of a meal. 10. Drink to Your Health. A splash of ﬂavor can make water your go-to drink. Add crushed fruits or small amounts of 100% fruit juice to water or sparkling water to make refreshing “ades” (like lemonade!). Iced tea with a little honey is another refreshing alternative to soda and other highly sugared drinks.